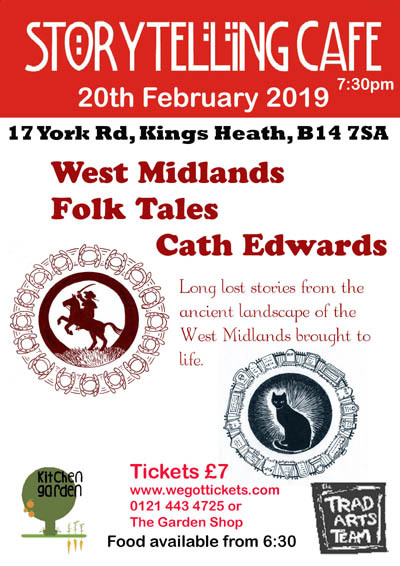 Tonight we welcome storyteller Cath Edwards who will tell tales from her recently published book, West Midlands Folk Tales. Cath’s spirited telling not only brings our West Midlands ancient landscape to life with lost stories and legends of ghosts, highway men and amazing local characters, but also gives insight into the history of our county as it was experienced by the ordinary people. This is a unique opportunity to hear stories, sometimes amusing and always gripping, firmly set in the old industries and told by a master storyteller in the warm, inviting and relaxed atmosphere of Birmingham Storytelling Café.